The Pinnacle Society is The Premier Consortium of Industry-Leading Recruiters in North America. 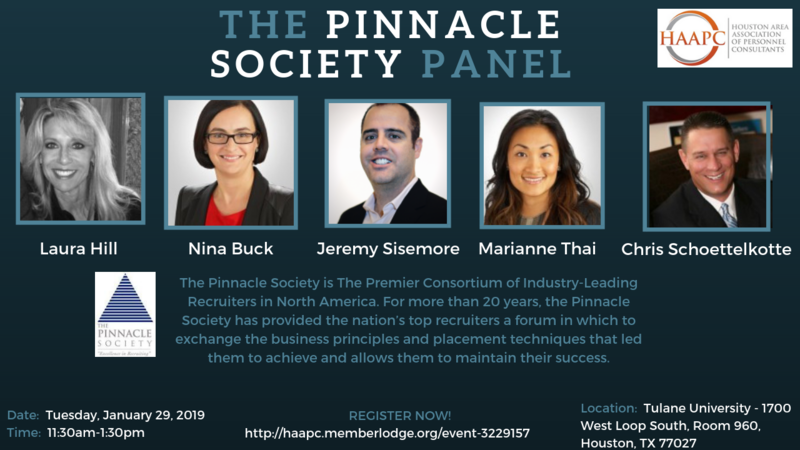 For more than 20 years, the Pinnacle Society has provided the nation’s top recruiters a forum in which to exchange the business principles and placement techniques that led them to achieve, and allows them to maintain their success. Please join us as a Pinnacle moderator is joined by multiple members of the current Pinnacle Society group. Panel members will be from multiple industries, covering a diverse range of topics. Questions may be submitted prior to the actual panel. Come with additional questions, as the moderator will open the floor for QA from the attendee group as well. Marianne Thai graduated from Baylor University in 1999 and Houston Baptist University in 2003 with her MHA, emphasis in Human Resources. Shortly after, she started her career as a professional recruiter. She has nearly 15 years of recruiting experience in the upstream oil and gas sector, with most of that spent as an employee at Walker Elliott, LP. In 2011, she was promoted to a Partner and remains part of the management team. Her expertise lies in exploration and production, specifically in the niche of petroleum engineers, geoscientists, and land professionals across the United States. Her clients range from small to mid-sized, publicly and privately held companies with domestic assets both onshore and offshore. She has placed over 100+ professionals and has built longstanding relationships with both clients and candidates. She acts as a consultant and provides professional expertise in business development and candidate retention. She takes the time to fully understand what her clients want, why they’re looking to hire, and how she can deliver services that will meet their needs. She also empathizes with candidates to understand what they will need to make a strategic career move and has their best interest in mind. What she delivers to clients and establishes with candidates is a process that she invests her time in developing and fostering. Marianne has had great successes throughout her career and attributes that fervor to satisfying the needs of her client and candidates alike. Beyond her professional accomplishments, she joined The Pinnacle Society in 2014. That has given her accolades and recognition as a respected recruiter not only among her peers, but also among her competitors. all levels of job placement from clerical to executive. Jeremy Sisemore has been one of the leading IT Executive Recruiters throughout North America for the past 18 years. He started his career with MRI and was Rookie of the Year in 2000 and quickly became the go-to resource for SAP & ERP talent acquisition needs nationally. Jeremy billed millions of dollars in placement revenue over 6.5 years with MRI, received a CSAM Certification and became known for public speaking on “best practices” within the recruiting industry. In his career, Jeremy has over $12 Million in personal production (billings) and has placed ERP & IT talent at all levels up to VP/CIO with over 75 major Fortune 500 clients throughout the United States, Canada, and Mexico. Today, Jeremy is CPC and CERS Certified and is a former member of the Board of Directors as Education Chair for The Pinnacle Society, a premier consortium of 80 industry-leading recruiters in North America. He speaks regularly at industry conferences such as NAPS, NCASP, The Fordyce Forum, HAAPC, and MASA among others. Jeremy and his business partner, Erek Gerth, founded ASAP Talent Services in 2006 and haven’t looked back since. Today the ASAP Team supports well over 50 of the world's leading companies. Their mission has been to create a boutique talent acquisition firm focused on the highest quality service and to form lasting partnerships with clients that are poised for growth, to be a total solution provider with respect to SAP Talent. Jeremy writes industry articles and has been quoted in CIO magazine. On a personal level, Jeremy graduated from University of Missouri where he was on the Swimming & Diving Team. He's married and is a father to two daughters and a son based out of Houston, Texas. Limited seating for this event, register now!